It's time for a new seasonal IPA from Ninkasi Brewing Co! First Rule IPA, originally part of the brewery's Rare & Delicious Series, will be widely available August through December in 12 and 22-ounce bottles and on draft. Brewed with six hop varieties including Simcoe, Citra, and Amarillo, First Rule IPA is sure to please hopheads. For more details, check out Ninkasi's press release below. EUGENE, Ore.—It’s no secret Ninkasi Brewing Company has a hop love affair. This continues to be evident in its newest Special Release Series beer—First Rule IPA. Originally released to Ninkasi’s Rare & Delicious Series in March 2017, the brewery is proud to elevate this beer to its Special Release Series in 12 and 22-ounce bottles and on-draft. 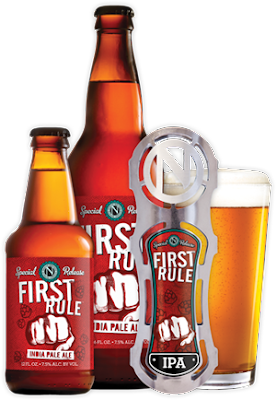 Available August through December, beer drinkers can find First Rule IPA across Ninkasi’s distribution footprint.